By-election to the Hamirpur parliamentary constituency will be held on June 2. As per the schedule announced by the Election Commission of India, notification for the by-election will issued on May 8 and the last date for filing nominations will be May 15. Having achieved the distinction of being the first “fully banked” state in the country, Himachal is all set to switchover from money order to e-payment mode for disbursement of old-age pension with the assistance of the Reserve Bank of India. The Hamirpur forest division has started an innovative project to popularise certain species of trees that have been found effective to counter planetary ill-effects on human beings in old scriptures just like precious stones. Though the government had transferred 1,830 hectares of forests in and around the town to the Forest Department for its better management and protection, but acute shortage of staff in the Shimla forest division specially created for the purpose is affecting development work. A fire broke out in the forest area near Nahan. The Fire brigade dispatched its team in the forest area near Kanshiwala, about 2 km from Nahan. The fire has damaged thousands of trees. Encouraged by the success of the Rs 6.78-crore community water harvesting and natural resources management scheme in Hamirpur district, the government has decided to replicate it in other areas of the state, too. With the announcement of the date for the MC elections, various political parties have started chalking out their strategy as both the Congress and the BJP have constituted election manifestos and screening committees. A joint deputation of the Baddi-Barotiwala-Nalagarh Industries Association and the PHD Chamber of Commerce and Industries, Himachal Pradesh, recently met acting president of the SAD Sukhbir Badal over an alternative route from Baddi to Chandigarh. There is good news for the lonely. “Sharan”, a Chandigarh-based organisation has decided to set up its branch in Shimla to fill joy in the lives of those who have been left alone due to circumstances. Condemning the killings in Nandigram, activists of the Akhil Bharatiya Vidyarthi Parishad staged a dharna at Himachal Pradesh University here today. 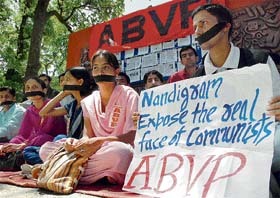 Campus secretary of the ABVP Naveen Sharma said two exhibitions had also been put up by the ABVP on the Nandigram issue. In an initiative to achieve government's Career counselling centre soon policy of employing 70 per cent persons in industries and projects from the state, the state government is set to start a divisional-level career counselling centre in Mandi. Three persons were killed and two injured in two accidents here last evening. Surjeet Singh and Surinder Singh of Ther village died on the spot when their motor cycle met with an accident while overtaking a truck at Harad bridge near here. The truck driver is at large. The police has booked an employee of Government Senior Secondary School, Bhareri, for siphoning off fees and other funds collected from students of the school. On directions from the Education Directorate the school principal registered a case against junior assistant Dinesh Kumar after a departmental inquiry found him guilty of embezzlement of over Rs 2.60. A Mexican tourist has gone missing after he fell down into a deep gorge from the snowline of the Dhauladhar range above the trekking point of Triund near Dharamsala, last evening. Telephone system collapsed in the entire Paonta area this afternoon which was not restored till late this evening. Thousands of BSNL subscribers of the town and surrounding villages were left with no option but to depend on mobile services. The CPM today complained to the state election commissioner about the gross violation in the preparation of the electoral rolls for the local municipal corporation elections at the behest of the ruling Congress. Former officer of the Indian National Army Pritam Singh Bakshi died following prolonged illness at his native village Kalu-di-hatti, near Palampur in Kangra district, early this morning. He was 90. Scrutiny will take place on May 16 and the last date for withdrawals is May 18. Votes will be counted on June 5 and the process will be completed by June 8. The model code of conduct has come into force with immediate effect in the districts which wholly or partly comprise the Hamirpur constituency. The commission has decide to use electronic voting machines in the by-election. Voter’s identification will be mandatory and separate instructions will be issued to allow additional documents, apart from electoral rolls and photo-identity cards, for the purpose. The seat fell vacant following the removal of BJP MP Suresh Chandel, who was one of the 10 members of parliament caught in the “cash-on camera” scam. Suresh Chandel had won the seat thrice in succession. Having achieved the distinction of being the first “fully banked” state in the country, Himachal is all set to switchover from money order to e-payment mode for disbursement of old-age pension with the assistance of the Reserve Bank of India (RBI). The RBI will provide software package to facilitate e-payment and training to staff for its implementation. Under the new system, pension will be automatically transferred to the account of the pensioner every month. The pensioners will not have to wait for the money orders that often get delayed, particularly in the far-flung rural areas. The government has purposely chosen the welfare department for introducing e-payments as it will not only ensure timely disbursement of pension, but also save around Rs 8 crore spent annually on sending money orders to over 2.50 lakh old-age pensioners. The department can utilise that amount on other welfare measures. Besides, it will considerably reduce the workload of the department and help save manpower. All 12, 13,276 households in the state were brought in the banking network last month under the drive for “total financial inclusion”. Norms were diluted and 81,371 “no frill” accounts were opened to ensure that there was no un-banked household in the state. The pensioners will be given option to continue with the money order system, if they find it inconvenient to avail the banking facility. If the new system functions smoothly, it will be introduced in other departments in a phased manner. In the second phase, 90,000 government pensioners will be brought under the e-payment system. The modalities for collaboration with the RBI will be finalised during the ensuing visit of its Governor Y.V. Reddy, who will be in the city from May 9 and 11. The software packages required by different departments for the purpose will be provided by the RBI. Chief Minister Virbhadra Singh will also take up with him the matter of opening a regional office of the bank in Shimla. At present, the officials have to go to Chandigarh for petty matters. Not only will the department provide information about the efficacy of each plant to control planetary impact on different persons according to their signs but will also establish a Navgrah Vihar near Baba Balak Nath temple at Deoth- Sidh. Hamirpur Divisional Forest Officer (DFO) Sanjay Sood, who has gathered information about planetary effects of trees from ancient scriptures told The Tribune "All our Puranas especially Matsaya and Vishnu Purana, the Vedas and Shrimad Bhagwat Geeta etc. have many references about the effects of trees." Utilising the information, the forest department will advertise about the qualities of different plants at prominent temples, prominent places and children park. Any person desirous of using trees to counter planetary ill effects and bring good luck will be provided information about the tree suitable according to his birth sign and plants will be given from existing 37 nurseries the DFO said. Some of the trees which have been found efficacious in the scriptures according to birth signs are aak (calotrasfisprosera) for sun sign, plash (buteamanospeema) for moon, khair (acacia cactechu) for venus, putkai (acaranthuspra) for mercury, pipal (ficus religiousa) for brihaspati, gular (ficus glomerta) for venus, shammi (prosopis cinnercia) for saturn, drub (cynodon dectylon) for dragon (rahu) and kusha (desmostaicia Bipaerata) for treating and curing effects of ketu. It was after much deliberation that the government handed over the forest land from the municipal corporation (MC) to the Forest Department last year, but with skeletal staff, neither development works nor any urban forestry programmes have made much headway. Despite the government granting clearance for felling of 769 trees, which had dried up and was declared unsafe within the MC area quite some time back, felling was yet to start as the forest staff was still engaged in its enumeration. Similarly, the task of preparing a working plan for scientific management of the forests in Shimla is also hanging fire because of the staff shortage. It was way back in 1985 that a working plan of the forests in Shimla was undertaken. While a total of 1020.32 hectares of forest fall in the catchment area, 443.19 is within the MC area and 9.5 hectares in craignanao. Though there is talk of protecting the thick deodar forests with focus on regeneration and scientific management but not much headway has been made. Headed by a DFO, the local forest division has 14 beats. Six posts of forest guards are lying vacant as only eight beats have a forest guard each. Similarly, three posts of deputy rangers are lying vacant despite a lot of burden as far as court cases concerning encroachments. A fire broke out in the forest area near Nahan. The Fire brigade dispatched its team in the forest area near Kanshiwala, about 2 km from Nahan. The fire has damaged thousands of trees. Fire could not be controlled as it was very difficult to reach near flames due to dense Lantana bushes in the area. Spokesman of the Forest Department said though the fire was out of control yet the fire fighting team had managed to create a fire line in the area to save the government forest from catching fire. He hoped that soon the fire would be under control. After conducting a survey, 12 projects involving an expenditure of Rs 9.94 crore have been formulated and the Centre has released the first instalment of Rs 1 crore for the implementation. Director of agriculture J.C. Rana said the projects would help conserve the land, water and bio-resources, which in turn would strengthen the agriculture sector and pave the way for its sustainable development. In Hamirpur, the project had not only provided water for irrigation, but also rejuvenated natural sources of water that had almost dried up. The Congress today constituted its election manifesto committee headed by revenue minister Sat Mahajan. The Congress screening committee will be headed by forest minister Thakur Kaul Singh. “We have fixed April 27 as the last date for applying for the party ticket,” said Viplove Thakur, HPCC chief. The BJP, too, is engaged in preparing its election manifesto under the chairmanship of Ashok Sood, who is the state BJP treasurer. The party has already received over 250 applications in the past 15 days, while the Congress received six applications today. A joint deputation of the Baddi-Barotiwala-Nalagarh Industries Association and the PHD Chamber of Commerce and Industries, Himachal Pradesh, recently met acting president of the SAD Sukhbir Badal over an alternative route from Baddi to Chandigarh. The deputation apprised him of the necessity of setting up the route. The road when completed would go a long way in easing the traffic on the Baddi-Pinjore road, said the deputation. Besides, the distance between Chandigarh and Baddi would be cut short by 26-km with the commissioning of the road. Badal assured the deputation to get the road portion falling in Punjab completed at the earliest. He further told the deputation that the road would be beneficial for the economy of Punjab as most of the raw material for the Baddi-Barotiwala-Nalagarh area was imported from Ludhiana, Jalandhar and Mohali. Founder of the Loner’s Club Chand Kapur said the overwhelming response from various parts of the hill state to the news story about the organisation published in The Tribune had encouraged her to launch a branch in Shimla. She was flooded with calls from persons eager to become part of the club. All those interested in joining the organisation would assemble on the Ridge near the statue of Mahatma Gandhi tomorrow and formally launch the branch of the club. She said the number of lonely persons who needed love and care was increasing with changing social values and family structure. They had no one to share their feelings or take care of their problems as everyone was busy with his own family. The best way out for them was to get together and form their own extended family to lead a life filled with happiness. Condemning the killings in Nandigram, activists of the Akhil Bharatiya Vidyarthi Parishad (ABVP) staged a dharna at Himachal Pradesh University (HPU) here today. Campus secretary of the ABVP Naveen Sharma said two exhibitions had also been put up by the ABVP on the Nandigram issue. He said the incident had exposed the double standard of the CPM and the SFI that claimed to fight for the cause of the farmers. He said it was unfortunate that the CPM, which was opposed to globalisation, privatisation and the entry of foreign companies into India, allowed the Nandigram incident to take place even when their party was in power in West Bengal. NAHAN: Members of the Nahan unit of ABVP took out a procession to protest against police atrocities on farmers in Nandi Gram in West Bengal, here on Tuesday. Students sat on a dharna in front of the DC office and latter assembled at Bara Chowk where they held a meeting in which all spokesmen of the ABVP criticised the communist government of West Bengal. They appealed that communist politics should be rejected as it was not in the larger interest of the nation. In an initiative to achieve government's Career counselling centre soon policy of employing 70 per cent persons in industries and projects from the state, the state government is set to start a divisional-level career counselling centre in Mandi. It will aim at developing soft skill and employability of over 3,000 students passing out from over 23 degree colleges in the central region every year. Mandi divisional commissioner, K.B.J.V. Subrahmanyam said here the counselling centre would be set up at the postgraduate college in Mandi and cater to students from 20 degree colleges located in Mandi, Kullu, Bilaspur, Hamirpur, Lahaul-Spiti and Solan districts. He said centre aimed at enhancing students’ soft skills, increasing his/her knowledge base and acquainting him/her with job requirements of scores of projects, industries and institutes that had come up in the industrial belt of the state over the years. In another mishap, three persons were injured seriously when their scooter was hit by a truck at Khushinagar near here. All three injured persons—Tarsem Lal, Ashok Kumar and Vijay Pal Singh — were rushed to the local civil hospital. Tarsem, who was seriously injured, was referred to Amritsar where he succumbed to his injuries. Ashok Kumar and Vijay Pal Singh were referred to Jalandhar and Amritsar, respectively. The police has booked an employee of Government Senior Secondary School, Bhareri, for siphoning off fees and other funds collected from students of the school. On directions from the Education Directorate the school principal registered a case against junior assistant Dinesh Kumar after a departmental inquiry found him guilty of embezzlement of over Rs 2.60. The embezzlement was detected during the audit in 2003 and 2006. It was found that Dinesh Kumar, who collected Rs 1.29 lakh vide receipt Nos 120 to 219 but did not deposit this money in the school account. Later, other irregularities were also detected. Instead of depositing the money in the school account Dinesh Kumar kept on depositing it in his personal account. When this financial irregularity was pointed out to him he made a forged entry into the school’s bank passbook which was later confirmed by the bank management. The police has registered a case against Dinesh Kumar. Identified as Jawao, he went for trekking on the Dhauladhar range along with a French national Stane, who informed about the incident to High-Point, a local travel agency, after returning, early this morning. 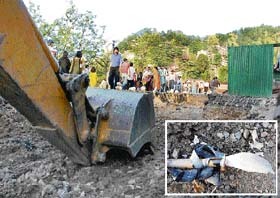 The police dispatched a five-member team under the leadership of local SHO R.P. Jaswal, who were still looking for the missing tourist. Telephone system collapsed in the entire Paonta area this afternoon which was not restored till late this evening. Thousands of BSNL subscribers of the town and surrounding villages were left with no option but to depend on mobile services. Banks and industries had hard time as their communication system, including fax and e-mail did not work today. Paonta BSNL divisional telecom engineer Jawahar Lal said due to some faults, including disrupted electric supply in the telephone exchange paralysed the telephone system. He said it would take few hours to restore the system. The CPM today complained to the state election commissioner about the gross violation in the preparation of the electoral rolls for the local municipal corporation (MC) elections at the behest of the ruling Congress. Former officer of the Indian National Army (INA) Pritam Singh Bakshi died following prolonged illness at his native village Kalu-di-hatti, near Palampur in Kangra district, early this morning. He was 90. The funeral was performed at his village and was attended by hundreds of people.